WineIndustry.Jobs is a Wine Industry Network (WIN) website and aims to be a resource for wine business job seekers and employers with the goal of making finding a new job or employee simpler and more affordable. WineIndustry.Jobs partners with WIN and the Wine Industry Advisor to extend the reach of new job postings to the thousands of daily WIN users and newsletter subscribers. We also partner with recruiters and staffing companies to provide quality advice and employment services if a simple job posting is not enough. ALKAR HUMAN RESOURCES offers temporary staffing, direct hire recruitment and temp to hire solutions to meet your human resource needs. Locally owned and operated for over 30 years, ALKAR has built a solid network of relationships in the Napa, Solano and Sonoma counties. With one call to ALKAR HUMAN RESOURCES, we will put this knowledge and experience to work, saving you time and money. All of our services are guaranteed. Our motto says it best, One Company One Call One Solution. Our Mission is to deliver the highest level of client service attainable in retained executive search. First and foremost, we are specialists in search, so we purposefully do not limit our practice to a narrow industry focus. As a boutique firm, we can minimize blockage issues. That is, because our work spans many industries, fewer companies in any given industry will be off-limits to us. 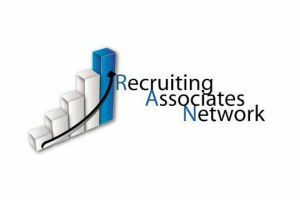 Recruiting Associates Network is a key resource in local and national wine industry recruitment. Our efforts are driven by the satisfaction of our candidates and clients alike. We are a one stop recruitment solution for a wide variety of organizations and the in the know recruitment associates for busy professionals. The simple key to our success is delivering top notch talent to our customers and providing outstanding opportunities to our candidates. Welcome to a boutique full-service recruiting firm focused on your success! Stefan Professional Recruiting is a boutique recruiting firm focused on Full Time, Direct Hire talent acquisition, recruiting, selection and placement for client-companies who seek customized service and expertise for their hiring needs. Coporate Engineering Manager, Senior EHSS Specialist, Fine Wine Sales Representative, Sales Manager, Technical Sales Representative, Data Coordinator. With unemployment record low, it's hard to find qualified candidates, but www.WineIndustry.Jobs reach dedicated wine industry professionals through Wine Industry Networks' newsletters, social channels, and Afternoon Brief. Additionally www.WineIndustry.Jobs also sources candidates from Indeed. Try www.WineIndustry.Jobs for your hiring news with our 10 cents a day offer. That's $3.50 for a standard 35 day job listing (regular price $65). Brand Ambassador, Account Manager, Client/Membership Services Coordinator, Commercial Director, Winemaker, Director of Business Development. Winemaker, Tasting Room Manager, Sales Representative, Tasting Room Sales Associate, Wine Club and Hospitality Coordinator, Metro NY Rep, Wine Educator, Customer Relations Representative, Wine Club Assistant, Bourbon Barrel Sales, Tasting Room Winery Assistant... www.WineIndustry.Jobs. To build a strong team, you need to reach the right candidates, and sometimes they are not even actively looking for a job, so you need to get in front of them where they are. WineIndustry.Jobs listings not only reach active job seekers who visit the job board or sign up for job alert emails, but also through syndication on Indeed, the Wine Industry Advisor, and in the wine industry’s leading daily wine business newsletter, the Afternoon Brief. Recruiting with WineIndustry.Jobs is designed to be simple and cost effective. Setting up an employer account is free and allows companies to manage all their job listings and see job post statistics and applications, from one simple dashboard. Listing a single job for 35 days is set at the low price of $65, but having an employer account also gives access to discounted multi-job listing packages, and employers who hire frequently can setup a monthly subscription for unlimited job posts. Employers can also boost the exposure of their job listing by upgrading it to featured status. Featured jobs are pinned to the top of the job board for 7 days, are given priority in syndication, and are featured in the Afternoon Brief. Upgrade to featured for only an addition $35. WineIndustry.Jobs was recently added to the suite of wine business services provided byWine Industry Network (WIN), the parent company of the North Coast Wine Industry Expo, the Wine Industry Advisor, WIN Data, and the U.S. Beverage Industry Expo. WineIndustry.Jobs builds on WIN’s mission to provide the best business resources in the wine industry by utilizing smart and cost effective information technologies coupled with a dedication to excellent service. If you have questions about using WineIndustry.Jobs or setting up a subscription or trial, contact jobs@wineindustrynetwork.com. If you're looking for highly skilled and dedicated wine industry professinals to work for your vineyard or winery, the Afternoon Brief, the wine industry's prefered wine business newsletter with 26,000 subscribers, is the place to reach them. Every day job posts from www.WINjobboard.com are included in the Afternoon Brief. If you create a featured job post on WIN Jobs, you place your opening in front of this pool of dedicated wine industry professionals. Right now you can upgrade you standard job post to a featured job post at no additional cost by using the promo code F35 when posting the job. Just enter the promo code before the payment, and you'll see the discounted price reflected in your total. "You cannot succeed without building the right team, and that's rarely a quick and easy process" said George Christie, President of Wine Industry Network. "There are a lot of steps involved, but ultimately it's about locating the right talent. Our objective is simple, we want to be the best place to post a job and the best place to find a job." Every day job posts from www.WINjobboard.com are included in the Afternoon Brief, the wine industry's prefered wine business newsletter with 26,000 subscribers. If you create a featured job post on WIN Jobs, you place your opening in front of this pool of dedicated wine industry professionals. Use the promo code on the WIN Job dollar below to try out www.WINjobboard.com for your wine job openings. For $35 extra, you can upgrade to featured listing, and Your job will be published in the Afternoon Brief, the wine industry’s leading newsletter sent to 26,000 wine industry professionals daily. Enter the code above when you arrive to the "payment" step of posting your job. We're giving away $1 job listing coupons and sweetening the deal with chocolate (while supplies last) at the Unified Wine & Grape Symposium. Visit the Wine Industry Network booth 1719 and get a fresh off the WIN Jobs printing press dollar bill coupon with a promo code for $1 job listings on www.WINjobboard.com. NB: The expiration date will be updated to allow ample time to use the coupon. Often we are asked about tasting room staff incentives for wineries and best practices for a program. An Incentive Compensation Program (ICP) is a tool used to motivate and compensate a sales professional to meet goals or metrics – over a specific period of time – to help achieve business goals. When well designed, an ICP should pay for itself. Based on the many conversations and our research, here are five tips for designing a program that works. 1. Reward the Right Things – Tie incentive compensation to all the key performance aspects of the Tasting Room Professional’s job. A quality ICP should focus your tasting-room team members on the full DTC Triple Score (wine sales, wine club sales and contact data capture). For the best results, we encourage having a blend of individual performance (so super stars are motivated to stay) as well team performance incentives (to avoid sales sharks). If the ICP is paid out based on team performance, be sure to always post individual performance as well to motivate (and attract more of) the super stars. Winners want to see their name at the top of the leader board. People who are not comfortable being held accountable for sales will not like this at all, and that is OK. They will go find another job that is a better fit. 2. Link Pay to Results– Base incentives on measurable, quantifiable results. Establish performance goals that are attainable with hard work, but not too easily achieved. There should be a challenge. It’s good to have an umbrella portion paid annually based on all the success of all DTC channels (TR, events, club, phone & web) to promote the importance of TR team’s critical role in selling wine club memberships and gathering more names to fuel the online and phone channels. Basically to reward everyone for playing well together. Dollars paid per club member should create goal congruence by escalating by club, based by price point. For example if a 3 bottle club pays $15, then the 6 bottle club should pay $30 and the 12 bottle club should pay $60 per new member. We’ve seen dollars paid per new club member from as low as $10 to as high as $120, depending on the club. 3. Establish Milestones – Measure your winery’s recent performance and establish relevant goals for improvement. Measure what matters, post performance visually, teach what the numbers mean and celebrate successes as you go. A great book on the power of this approach – called Open-Book Management – is The Great Game of Business, written by Jack Stack. A wonderful guide to measuring and sharing numbers that matter. In addition to total sales, total new club members and total names captured, be sure to also talk about conversion rates and average order size metrics. This will allow those who work part-time to still measure their success and have pride about their own performance vs. group progress. Agree on one book of record – usually the winery POS system – which should be available to all team members so that they can access to see how they are doing on a given day, week, month. 4. Focus on the Long Term – Since the wine club is typically the most consistent, largest revenue stream, getting and keeping club members is extremely important. Additionally, continuing to grow your mailing list /database of your customers is equally important for long term growth of the business. Club: Best practice is to pay team members individually for wine club sign ups (and allow/ plan for sharing) then have a kicker that everyone benefits (i.e., everyone gets another $1 or $2 per member sold all month) by when monthly new club membership goals are exceeded. This promotes great camaraderie and support among team members. Club: We are starting to see additional winery incentives based on tenure – or other total wine club membership goals – as well to motivate TR staff to continue to treat club members as VIPs when they visit the winery. Contact Data: We’ve seen wineries pay anywhere from $0.10/name to $1.00/name. Web sales metrics will calculate the average value / email name for each winery. Those will give you some guidelines of what makes sense for you brand. Contact Data: Start by having data capture contest with wine prizes. Engage the team in finding many different ways to effective capture more names. Contact Data: Once you move the needle (raise your contact data conversion rates) you’ll establish your “new normal.” Then you can roll into an individual ICP program, structured similar to club ICP but with a smaller $ / name. 5. Tie it All Together – By tying incentive compensation to desired performance, you can identify, motivate and retain your most valuable employees. There should be no limit (ceiling) to the ICP. The best sales people think in terms of “you don’t limit my compensation and I won’t limit your sales.” Effective sales ICP are structured so they are self-financing. Meaning you are not paying out much (if anything) until the budget has been exceeded. It is the incremental sales that should fund the ICP. If you have multiple locations, hopefully you can establish the same structure across all properties, although the dollar amount paid per new member will vary based on the different club price points. When you pay (immediately or at time of one or more shipments) and penalties for early drop outs (if any) should be consistent. We are seeing more and more wineries implementing ICPs beyond wine club sign ups. Don’t be afraid of this performance-based culture change. When managed wisely it really works and will pay for itself – implementing a well thought out ICP can be rewarding on many levels. WISE Academy (Wine Industry Sales Education) offers a comprehensive curriculum designed specifically for wine industry professionals. Built from a belief that direct- to-consumer (DTC) results are the key to success in the wine industry, WISE offers the only wine industry education, training and certification program dedicated to DTC sales and marketing. All WISE classes and on-site coaching workshops enhance the expertise of DTC sales and marketing professionals while igniting their passion for producing the kinds of measurable results that lead to winery success. Our courses and workshops are available in three different levels to meet the needs of everyone in the wine industry – from new industry enthusiasts to seasoned direct sales managers to winery CEOs. Founded in 2008, the WISE Academy is led by Chairman Lesley P. Berglund, a wine industry DTC pioneer and serial entrepreneur. Complete course catalogue and services descriptions are available online atwww.WineIndustrySalesEducation.com, or for more information, call (877) 740-WISE (9473). Providing a holistic package for your employees not only helps you attract a higher caliber candidate, but also improves retention. It sends a message to the market place that this isthe place to work, and in turn helps with future recruitments as your current employees will be more apt to refer other great people to your organization. “Buying” an employee back when they try to resign, a counteroffer, rarely works out, even in the short run. Ninety-eight percent of the time, the employee leaves within six months to a year and a half, and often with more acrimony than the first attempt. Management makes a counteroffer to solve an immediate problem. You got caught off guard. Management had to do something quickly. Later, when the realization comes to mind you were “blackmailed”, held up by an employee who was unhappy and leaving, and you were taken advantaged of, this will cause resentment. The trusted relationship between management and employee is broken – it is not the same anymore. In essence, the employee fired management and/or the company or they at least tried to do so. No one likes to be fired. Money and title, the two most popular tools used in a counteroffer, are temporary.Most of the time, the adjustments management made to keep an employee are cosmetic and will rarely overcome the underlying reasons as to why the employee wanted to leave in the first place. After the “glow” of the importance of money or title wears off, the employee is mentally and emotionally right back where they were before. Normally, for the counteroffer to be successful, management had to involve other managers, usually including someone above them. What are they going to think of the manager should the employee (or another similar employee) do this again? When/if this employee eventually leaves anyhow, the manager’s acumen will be questioned – the manager is at risk and the manager is not going to feel comfortable with the employee. The employee bought back probably got some increase in salary (perhaps a significant increase). That fact is going to backfire – when the salary reviews come around again, management is going to remember how they were leveraged. Management is going to feel like the employee already got a raise. The employee doesn’t feel that way at all. He or she is going to expect a raise like everyone else. It is a “no win” deal. Counteroffers rarely work. It seems like a good idea at the time, and the company or management might believe they have to do it for sheer survival. However, in short order, on a confidential basis, management is going to start looking for that employee’s replacement. We know that because Mitroff Consulting & Associates has been retained, numerous times, by many companies to do a “confidential” search to replace the “successful” counteroffer employee. 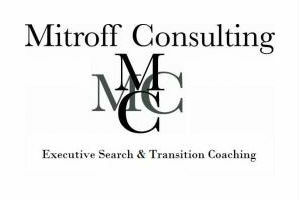 Mitroff Consulting’s Mission is to deliver the highest level of client service attainable in retained executive search. First and foremost, we are specialists in search, so we purposefully do not limit our practice to a narrow industry focus. As a boutique firm, we can minimize “blockage” issues. That is, because our work spans many industries, fewer companies in any given industry will be off-limits to us. A standard job posting on WIN Jobs is only $65 for 35 days, well below the industry standard. Featuring a job post is $35 extra and not only places the post at the top of the board for 7 days, but guarantees that it will be featured in the Afternoon Brief. Every weekday, featured job postings and links to more jobs appear in a WIN Jobs section of the Afternoon Brief, the leading wine industry newsletter with over 26,000 subscribers. Post a job and create a free Employer Account on www.WINjobboard.com during the month of October and receive 50% off new job listings for 1 year. After posting your job, you will be prompted to create an Employer Account. Within one business day of setting up the Employer Account, you will receive a personalized promotion code for 50% off our already low job listings rates, and it's valid for unlimited job listings for 1 year. After posting your job, you will be prompted to create an Employer Account. Within one business day of setting up the Employer Account, you will receive a personalized promotion code for 50% off job listings valid for unlimited job listings for 1 year. The new employer account feature on WINjobboard.com allows companies to create a free login to manage all their job listings and see job post statistics and applications, from one simple dashboard. An account is helpful for easily accessing data and managing one job post, but becomes invaluable with multiple job listings, simplifying both posting and management. While no purchase is necessary for the creating of an account, having an Employer Account gives access to discounted job listing packages. A standard job listing is $65 (35 days), but a package of 5 job listings is only $200. Use one or more now and save the rest, they never expire. If you want to try out WINjobboard.com and the new Empoyer Account feature, but are not ready to buy a job listing package, use this promo code: F35 for a 35% discount on your first job listing. It doesn't have to be expensive to get your job listings in front of the right people. Get 35% off WIN Jobs' already low rates and take advantage of the reach of the extensive reach to fill your job openings with the right people to build the best team. Go to www.WINjobboard.com and use promo code F35 to list your jobs for 35% off. Every day job posts from www.WINjobboard.com are included in the Afternoon Brief, the wine industry's prefered wine business newsletter with over 27,000 subscribers. If you create a featured job post on WIN Jobs, you place your opening in front of this pool of dedicated wine industry professionals. WIN Jobs offered one hundred $1 job posts - most of them are taken, but a a few are still left. Use the promo code dollarjob when you post your job opening on www.WINjobboard.com and the job post will cost only $1. The promo code expires July 31 - or sooner if the remaining codes are used. Want to make sure your job post gets seen by the right people? Feature your job post for only $35 extra and it will be featured in the Afternoon Brief, the leading wine industry newsletter received by over 26,000 industry professionals every day. Vineyards and wineries have begun advertising for harvesting and cellar help and interns for the 2015 harvest season. See some of the wineries searching for harvest employees and post your notice today on www.WINjobboard.com for $1 with the promo code dollarjob. Are you hiring? check out the latest job posting promotion. April 7, 2015, Healdsburg, CA – The Wine Industry Network (WIN) today announced the launch of WIN Jobs, www.WINjobboard.com, a new job site that will feature wine industry employment listings for individuals looking for new career opportunities. The intuitive platform will make posting new positions easy and affordable for hiring companies while leveraging the extensive reach of the Wine Industry Network to place job postings in front of relevant candidates. Based in Healdsburg, CA, WineIndustryNetwork.com is the wine industry’s most comprehensive business resource website operating as an on-line trade show and created specifically to help industry professionals locate and connect more easily with the industry’s best suppliers and service professionals. WIN also produces the North Coast Wine Industry Expo www.wineindustryexpo.com, based in Santa Rosa, CA, the online industry publication, the Wine Industry Advisor (wineindustryadvisor.com) and WIN Jobs (www.WINjobboard.com), an online employment resource. Celebrating the launch of the WINjobboard.comemployment site, WIN Jobs is offering $1 job postings for the first one hundred wine businesses posting a job using the promo code: dollarjob. A standard job posting on WIN Jobs is only $65 for 35 days, well below the industry standard. Featuring a job post is $35 extra and not only places the post at the top of the board for 7 days, but guarantees that it will be featured in the Afternoon Brief. WIN Jobs partners with industry recruiters and staffing companies to provide quality employment services to those in need of additional support, as well as Expert Editorial about Employment & Career. WIN Jobs utilizes the reach of the Wine Industry Network ensuring that job postings reach their audience through social media and email campaigns. 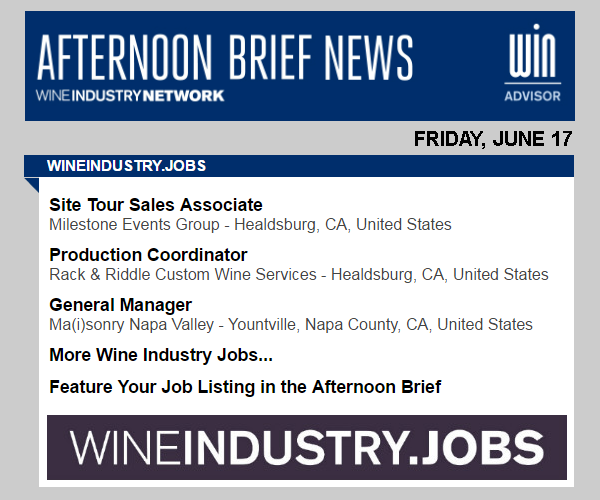 Every weekday, featured job postings will appear in a WIN Jobs section of the Afternoon Brief, the leading wine industry newsletter with over 26,000 subscribers. The job posting interface is very simple and easy to navigate, and job seekers will have the unique opportunity to sign up for customized alerts based on job type, ensuring they never miss a chance to apply for the perfect job. The new site is responsive and looks equally great on a desktop, tablet, or smartphone.